Last Saturday, our family was invited to have a cooking and baking fun with the Bosch Series 8 Ovens in a fully-equipped Bosch Kitchen at the Bosch Experience Centre in Bishan. 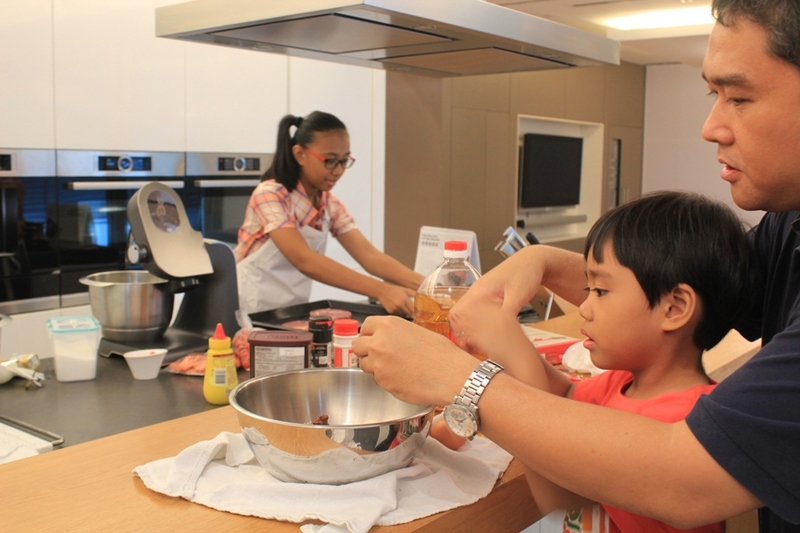 When K started secondary school early this year, her interest in cooking and dream to be a Junior Masterchef was rekindled by her cooking subject. I RSVPed for the invite mainly because I knew she's going to have a blast playing as Junior Masterchef for a day, or half a day to be exact. Having said that, my not-so-little G is also into cooking and baking. All thanks to "I Can Cook" CBeebies show, he exclaims "Mom! I can cook!" whenever he wants to cook. We have been cooking together his all time favourite scrambled egg with cheese and blueberry pancake almost every weekend. He likes cracking the eggshells and he loves mixing the pancake batter all by himself. 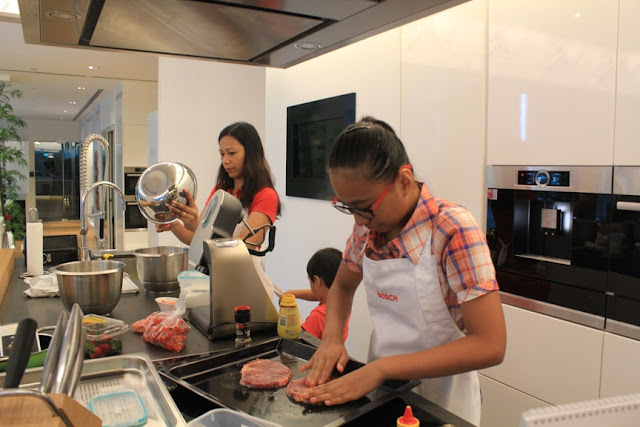 My cooking sessions with K and G have always been messy but it also spell S-O M-U-C-H F-U-N! I told ya! Haha! 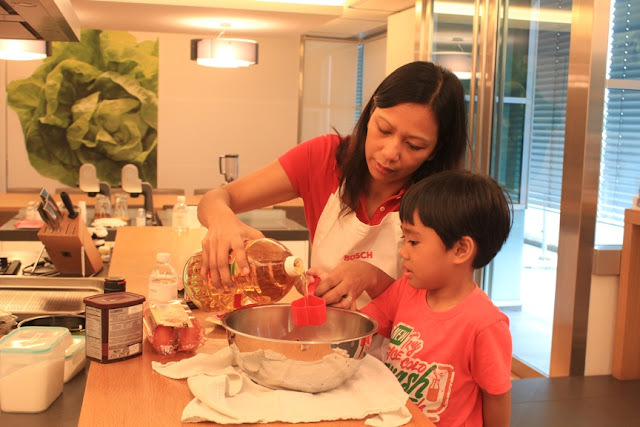 Here's our basic formula for successful cooking session at home: Mess + Fun = Yummy food cooked with lots of love and laughter with the kids! 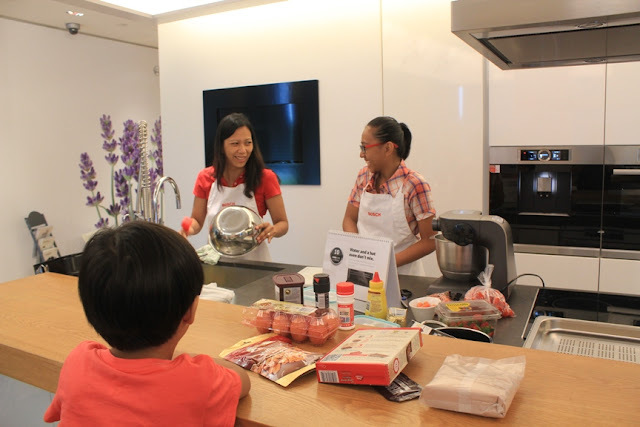 Here, K was telling me she was so stoked that she get to cook in a functional kitchen showroom fully equipped with all the things she needs. At home, we don't have a proper mixer (have yet to invest on it) so we normally DIY the mixing part when baking. 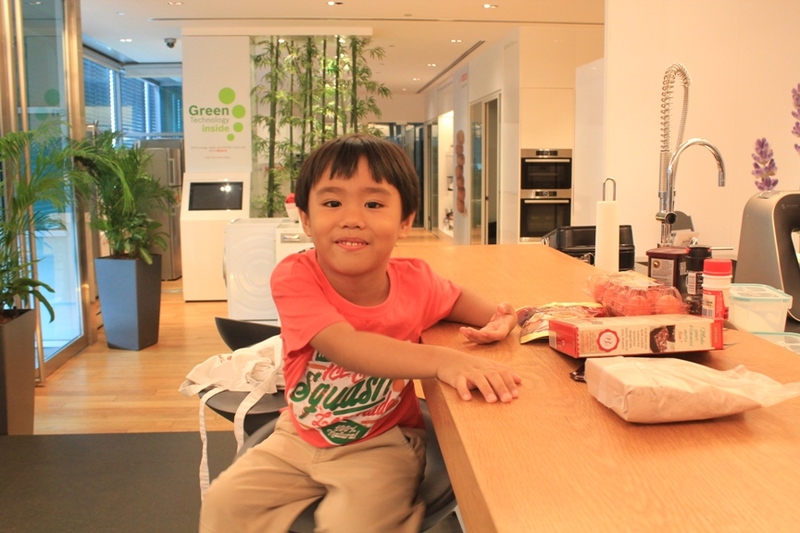 Meet our kitchen assistant for the day, cheeky G, who refused to wear his baby apron. The night before, I told him we are going to bake a big chocolate cake and he got really excited. Yes, this boy is a certified chocolate and strawberry monster. We let him eat strawberry almost everyday as dessert but we try to control his chocolate intake. Pardon for digressing, let's get back to cooking and baking shall we? K took charge of roasting the ribeye beef. Here, she's seasoning the beef after de-frosting it from the Bosch Series 8 Oven. I on the other hand is preparing the mixture for the Chocolate Chip Brownies whilst G is busy playing with my apron string behind me. In fairness to our little kitchen assistant, he also helped adding cooking oil, water, and egg in the brownies mixture. 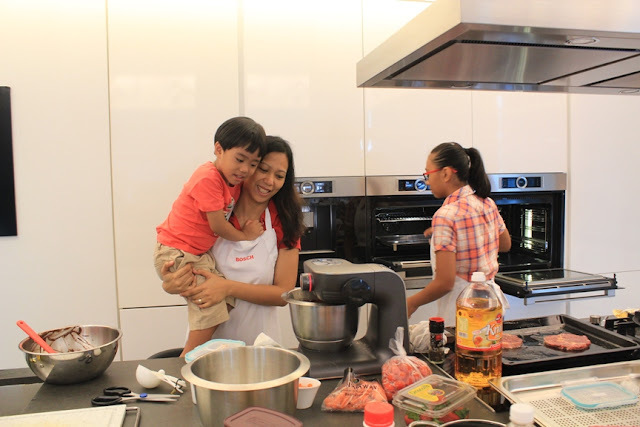 When I put the brownies batter in the Bosch mixer, he begged me to carry him so that he could see the brownies batter being mixed. Everything really is interesting in kids' eyes. Wish we adults would take after them, taking delight even in the most ordinary things. My apologies, I tend to get carried away with my train of thoughts. Haha. K was seen here tinkering the two oven behind because she is ready to roast her seasoned ribeye beef. 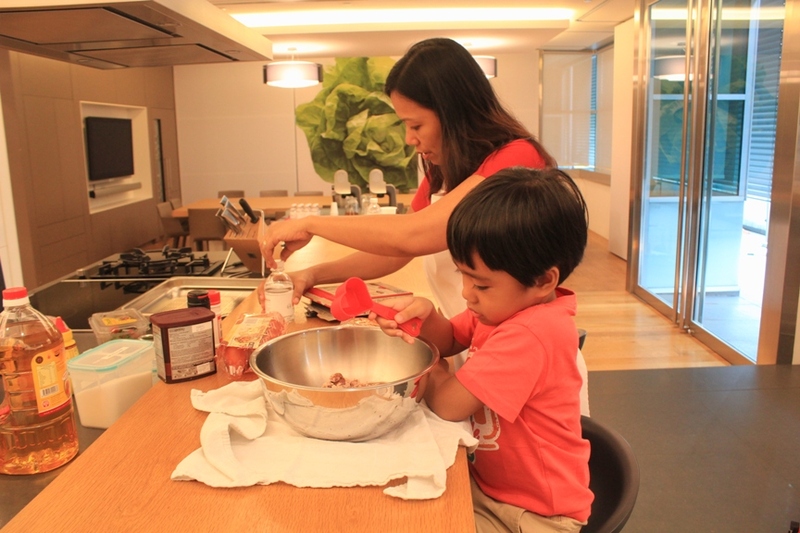 After mixing, we are ready to bake our brownies! Here, I am pouring the mixture in the baking pan whilst G salivates looking at the chocolate coloured batter. Haha. Whenever we bake, G is always tempted to taste the batter but I always warn him not to because of the raw egg. Nowadays when we bake, he tells me "Mama, cannot eat. It's raw!" in advance before I tell him myself. Haha! Such a good and clever boy. Presenting! The product of our cooking and baking fun: Roast Ribeye Beef with baby carrots and Chocolate Chip Brownies. K's roast ribeye beef was a success, she devoured it with the hubby right there and then so I wasn't able to get a good close up photo. 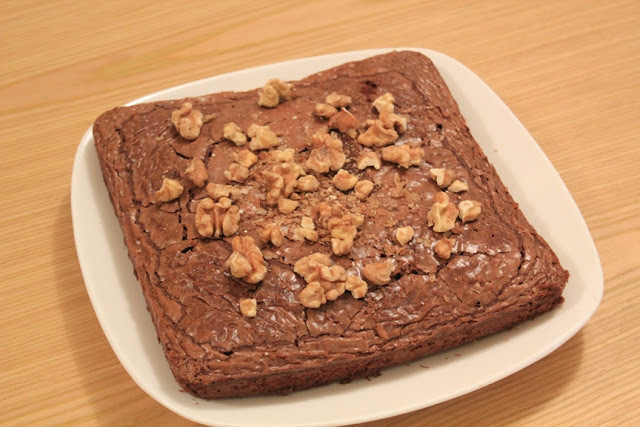 My chocolate chip brownie with baked walnuts on the other hand looked too dry but it's actually cooked perfectly. It's not as moist as I wanted it to be but it isn't too dry too contrary to how it looked in the photo. You can view my styled Instagram photo of the brownies here. Often, home-cooks and professional chefs rely on their senses to gauge when a dish is done to their preferences. With the new Bosch Series 8 Ovens launched today, you no longer need to resort to tactile practices to achieve perfect cooking results. Equipped with highly-sophisticated sensors, the ovens will automatically make the necessary adjustments and allow you to prepare lavish spreads with minimal effort. 4D Hot Air: The newly-developed 4D hot air technology ensures even heat distribution for well-balanced cooking results. Cooking trays can now be placed on any of the oven’s four baking and roasting levels and the best results will still prevail – even when you bake and roast on all four levels simultaneously. Steam-baking & Microwaving: With the integrated steam injection function, meat dishes roasted with hot air and steam become crispy on the outside and succulent inside. The oven will also allow you to steam vegetables and fish traditionally. When the microwave feature is switched on, dishes can be cooked up to 50 percent faster. Perfect Bake: With the fuss-free Perfect Bake sensor, all you have to do is select the desired bake-type, and the oven will automatically set the ideal heating mode, temperature, and duration. Underbaked or burnt cakes will now be a thing of the past. Perfect Roast: The new Perfect Roast meat probe, a device that measures the core temperature of meats at three different points, is ideal for preparing meat, poultry and fish. Its high level of accuracy promises perfect roasting outcomes. About Bosch: For over 75 years, the name Bosch on household appliances has stood for expert development, technical quality and reliability. True to company founder Robert Bosch's goal to develop "technology for life", household appliances from Bosch have always made people's day-to-day lives easier and improved their quality of life. 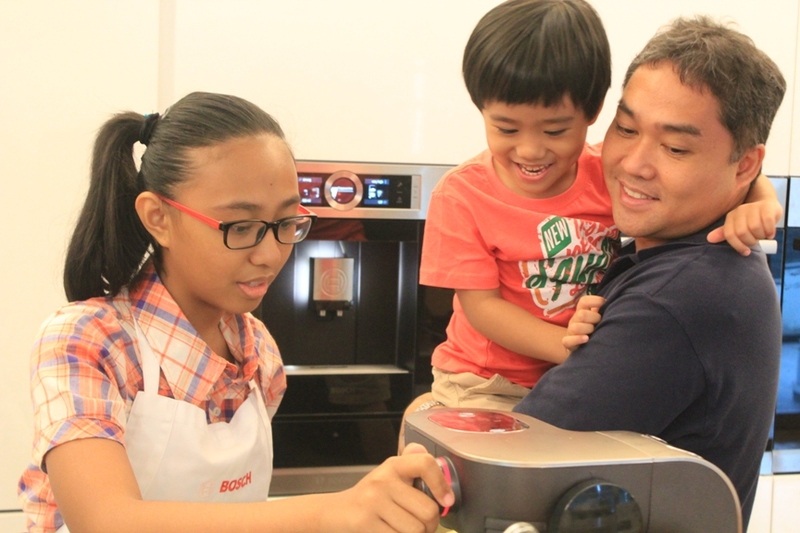 Today, Bosch is the leading brand of household appliances in Europe. Refrigeration appliances, washing machines, dishwashers, cookers and consumer products from Bosch are sold all over the world. The pursuit of quality and technological perfection is also reflected in the company's product design. Treating people and nature with respect has been a corporate principle from the beginning and is reflected in the company's energy-efficient, resource-conserving and sustainable products and processes. Robert Bosch Hausgeräte GmbH is also active in training and education and strongly committed to youth culture initiatives and helping homeless children. Bosch offers quality and perfect technology for a better life. 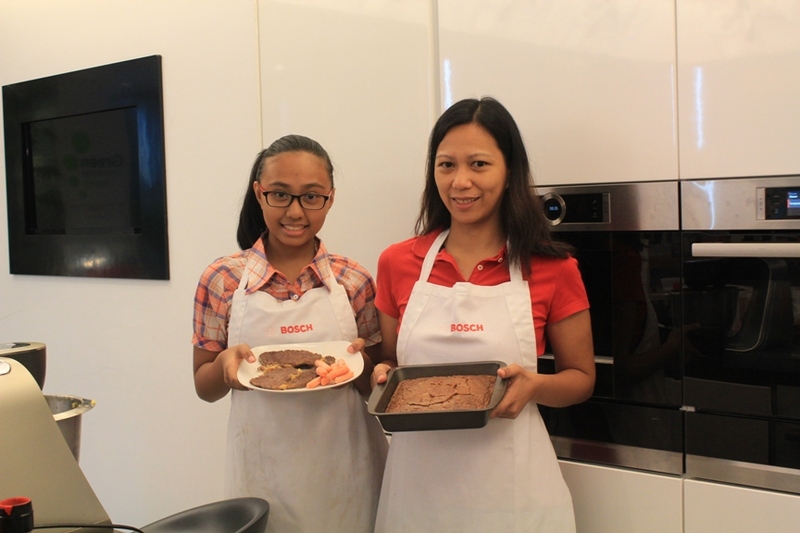 For more information, visit www.bosch-home.com.sg. look at G, he's grown a lot since last time I saw him!!! and K too!!! and yes, same here as well, messy kitchen=happy tummy and hearts!! :) They say a very clean and sparkling kitchen means hardly anything is used, haha. I know some who don't enjoy cooking and mostly make ready to make foods ( just heat up) but they have very high end kitchen just for display only since they do not want to mess it up, haha!! happy are we who finds joy in messing the kitchen :) oh, love love the brownie. Too bad you were not able to take picture up close of K's rib eye steak. I bet it was soo good that's why she and M finished it right away. They grow up too fast, Beth. I almost couldn't keep up. Haha! What an exciting activity! I can imagine how happy the group while they are cooking. I want to try the same activity with my friends. That looks so fun! 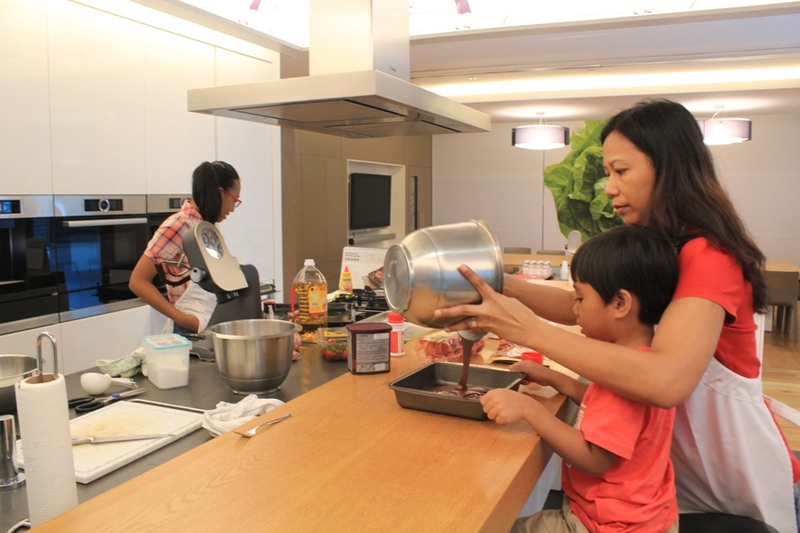 It always feels great when I'm cooking or baking with my kids. Great bonding time over cooking and baking, no? 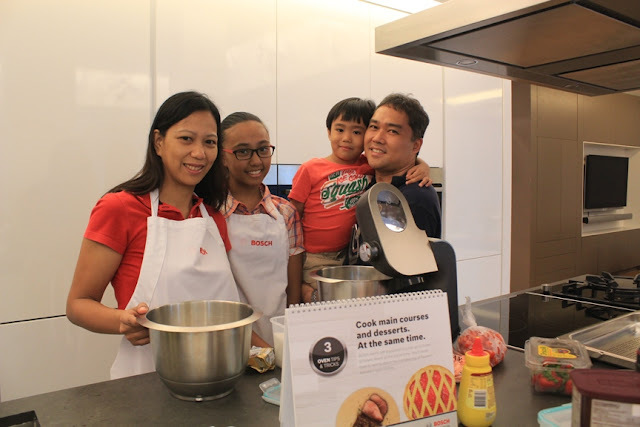 Such a great baking experience for your family. If we were inn your place then, taga kain lang ako.